A Sunday dinner classic, za'atar gives crispy potatoes an intriguing flavor that complements the traditional lemon rosemary roasted chicken. The whole chicken is coated with a flavorful butter blend including garlic, thyme and lemon. It is then roasted to golden perfection. The chicken pairs perfectly with the crispy potatoes because the za'atar spice blend also contains thyme as well as oregano, marjoram, toasted sesame seeds, and sumac. Both are hot from the oven and ready to serve at the same time! Save time by preparing the chicken ahead of time and refrigerate until ready to be cooked, right before dinner. Za'atar can be found at fine grocery stores or specialty ethnic markets. You won't regret adding this flavorful blend to your spice rack! Per Serving: 1178 calories; 73g fat; 29.8g carbohydrates; 98g protein; 419mg cholesterol; 549mg sodium. This was really good, especially the potatoes. We are going to make this recipe again for Christmas! 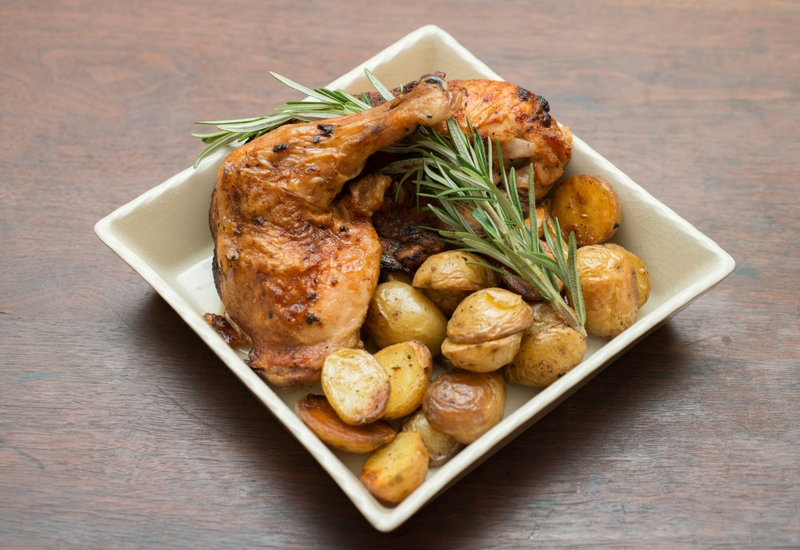 Very good roast chicken recipe! Love the garlic, thyme and rosemary for flavor. Also, this was my first time using Za'atar. Loved it! I enjoyed this dish thoroughly.